A figure-flattering choice, this short homecoming dress has eye-catching details to make your semi-formal event extra special. Gleaming embroidery swirls across the illusion high-neck bodice with sweetheart lining, while tonal beading adds shimmer to the delightful short party dress. The high neckline gets support from thin straps that climb the shoulders before attaching in back. A dazzling band of stone accents wraps around the natural waistline to top the fully-lined short skirt that flares away from the hips for a fabulous silhouette. 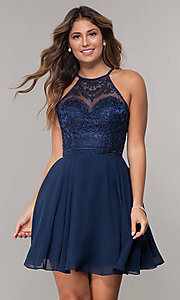 Available in misses and extended sizes, this budget-friendly short homecoming party dress, under $150, takes standing out in a crowd to beautiful new heights for weddings and hoco 2019 parties.